The Madison Metropolitan School District has been a leader in creating inclusive educational opportunities for children. Since the District’s closing of Badger School in 1977, there has been steady progress toward fully including our children with disabilities in the general educational experience in our schools. Most children with disabilities now attend their neighborhood school where special education and classroom teachers work collaboratively to ensure that the learning experience is appropriate for every child in the classroom. The sense of community and relationships between students with and without disabilities that develop in the school setting set the stage for many of our disabled citizens to join a pluralistic society as adults. Our community at large is enriched by providing valuable opportunities for children with disabilities to move into the world of work and be productive citizens. On Saturday December 3, 2005 we held the first day of games for the new 9th and 10th grade extramural basketball league. We had 71 participants for a total of 8 teams and roughly 100 spectators including parents and friends of players. All participants, coaches and specators were very respectful and well behaved and created a fun and recreational atmosphere for the day. Skill levels of participants varied greatly and all students received equal playing time. Or, What Is This Old Building Worth? Photo of Washington Public Grade and Orthopedic School, 545 W. Dayton St., Madison Trust for Historic Preservation. 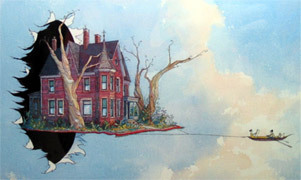 To see where it is located, click here. Complex problems require creative solutions. But what happens when innovative ideas don’t get serious consideration? This fall, the Madison School Board assembled two task forces to propose solutions to the knotty problems of shifting enrollments and facility use in the East and West/Memorial High School attendance areas. The people tapped to serve on the task forces have put in long hours and, in the process, have come up with some creative options that go beyond the “standard” proposals to close schools and/or move boundaries. Unfortunately, at least one credible idea for fully using space in East side schools with low enrollments has been taken off the table. The proposal definitely represents “new thinking.” Rather than closing schools that don’t have “enough students,” the proposal is to sell the Doyle administration building and relocate district administration to one or more of the under-enrolled schools on Madison’s East side. Also, I am glad to know that you see the issue of heterogeneous versus homogeneous grouping in classrooms as “a broader policy issue” that the BOE has a responsibility to involve itself with. I hope you will also agree that the conversation — if it is to be a responsible and meaningful one — must be empirically based. To that end, parents have repeatedly asked District officials for MMSD data and empirical studies from the educational literature that support, for example, the changes being made at West and the District’s drive, generally, towards heterogeneous classes in our middle and high schools. I hope you, too, will insist that those data and studies be brought forward and evaluated thoroughly before any actions are taken. Curriculum - Languages, Governance/Board Decision Making, Student Support, What Can I Do? Thank you for the response. I am somewhat confused however regarding your statement concerning the Board’s role. Maybe you could define what is included under ‘set policy’ and what is excluded. I am aware of the situations you reference regarding the BOE and what some may consider poor decisions on subject matter and censorship. I also believe the public was able to vote boards out when the decisions made do not reflect community opinion. I thought our BOE was responsible to control the Administration’s decisions regarding just these type of issues. With a child entering West next year, I am personally very concerned with what I perceive is a reduction in education quality at West. We see this in English, in the elimination of Advanced Placement Courses, through the homogenization of class make-up which ignores student achievement and motivation. In addition, I really do not feel we can allow much time to resolve these issues, especially when decisions can be made in closed door sessions and without supporting data. This is an open response to Mary Battaglia and Larry Winkler’s posts on the data showing rising numbers of low income and minority students in the Madison Metropolitan School District. I tend to agree with Larry Winkler’s take that the “low income” and “minority” data is more of a diversion from the larger discussion of standards and achievement in our schools. The district and board have presented data on low income and/or minority status (not synonymous) as if it is an explanation or an excuse for the low expecations and low achievement levels of portions of the district student body. We need to rethink to how our schools and educational programs operate and are staffed if we are to achieve high educational standards during a time of demographic change. We are seeing changes that include more low income students, students of color, populations for whom English is a second language, and students of all backgrounds who face extraordinary challenges at home. We also are seeing more stress among students who are under extreme academic pressure at home and at school in ways that did not exist twenty years ago. Virtual Schools – Cash Cow Dry??? 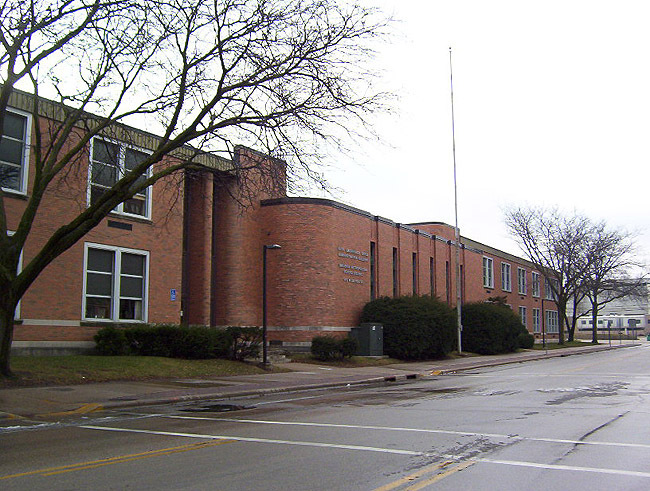 With a contract to open the first statewide virtual high school before them, the mood of the members of the Waukesha School Board at their January 2004 monthly meeting was effusive. A cost simulation showed that the school – called iQ Academies at Wisconsin – could start generating as much as $1 million for the school district by the 2006-’07 school year. “Pretty sweet,” board member Daniel Warren said about the numbers. A little more than a year into the iQ’s operation, however, the school has yet to come close to matching the board’s high hopes. The Martin Luther King, Jr. Coalition is inviting all local citizens to share in a brief ceremony commemorating the 50th Anniversary of the historic Montgomery Bus Boycott. The ceremony will be held on Monday, December 5, 2005 at 12 noon in the lobby of the Madison Municipal Building (215 Martin Luther King, Jr. Blvd.). It will begin at noon with a brief program featuring comments by current civil rights leadership as well as Madison’s Mayor. Their words of reflection will be followed by a reenactment of Ms. Parks’ courageous stand on the bus some 50 years ago. Madison School District: Anticipate More Busing – Kurt Gutknecht (Fitchburg Star). One of the more detailed articles I’ve seen on the East / West Task Forces. Budget/Financing, Community Partners, Governance/Board Decision Making, School Climate, Student Support, What Can I Do? Fascinating. Statements and questions from parents, including those who send their children to private schools. Well worth watching. Cherokee questions pending. Thanks to MMSD-TV for recording and broadcasting the Hamilton event. I came across this article from the Black Commentator written by Paul A. Moore. It is very interesting and I thought I would share it. I agree with much of it, however, some of it I don’t. I have never been a fan of talking about “The Achievement Gap.” I even argued about this with my campaign team in 2004. I hope to write about this when I get some quality time to collect my thoughts. I personally would rather focus on “Achievement” for our students and less on the “Gap.” Enjoy. the state Department of Public Instruction to create rules forcing Wisconsin schools to offer uniform programs for gifted and talented students. State law already requires districts to identify students who qualify as gifted and talented and offer appropriate programming. But Todd Palmer, a Madison attorney spearheading the parents’ effort, said Thursday schools have pulled resources away from those programs because of ongoing budget problems. The parents filed a petition for rulemaking, a rarely used option to ask the agency to create new rules. My name is Todd Palmer and I am a parent of three students enrolled in Wisconsin public schools. I am writing to ask for your help on a matter which should not take more than several minutes of your time. Specifically, I am asking you to sign a Petition requesting that DPI promulgate rules to govern public school districts in providing access to appropriate and uniform programs for pupils identified as gifted and/or talented. This Petition was filed with DPI on November 29, 2005 under the signatures of several parents and educators. However, this effort could use additional support from you. This would involve a minimal effort on your part, but has the potential to greatly benefit your children and/or students. Thank you for your email. I have been following the discussion on the proposed changes to English 10 at West. I know that there have been various conversations between West High staff and parents and downtown administrators. I believe that a number of the concerns raised by parents are being given serious consideration. I really think you need to allow some time here. I do see a broader policy issue of the question of heterogeneous grouping. Since this is really in the area of the Performance and Achievement Committee, I will talk with Shwaw Vang about having a meeting on this topic. Given the current schedule of Board meetings it looks as if January is the earliest we can have a meeting on this. It is important to remember that the Board’s role is to set policy not to get involved in curriculum decisions. Just to remind you of some of the pitfalls of having politicians make curriculum decisions: there is the national controversy over the teaching of evolution and the example of the Dover PA board; there is also the current push to require the use of abstinence only programs; and lastly various attempts to censor what books are used in classrooms. P.S. If you decide to forward or post this, please use the entire response. I am writing to request that you put a discussion of the plans for English 10 at West HS (and the question of whether or not West’s English 9 course has been appropriately evaluated, and whether or not the results of any evaluation support the implementation of English 10) on the agenda of a BOE meeting as soon as possible. I believe it is time for the BOE to step in and take seriously its responsibility to students by insisting that the West administration make a sound, empirically-based decision. It is easier to be a genius when you don’t have to pay the rent. We live in a world that values dependability over brilliance and where jobs that reward curiosity may not support a family. The time to explore and take bold risks is a luxury few of us, genius or not, can afford once we leave school. Measuring programs for gifted children by the success of their adult graduates overlooks the significant hurdles that lie just after graduation. I have found that there is often an inverse relationship between what I perceive to be a genuinely innovative thinker in my third-grade classroom and the attitude of the parents. The most intellectually curious and imaginative problem solvers have parents who are supportive of rather than ambitious for their child. And each year I am struck by how some of the most perceptive children come from families whose parents have no time to advocate for them and no “gifted” agenda to pursue. Holly Batsell, a Language Arts teacher at Sandra Day O’Connor High School in the Deer Valley Unified School District, comment on how she and her colleagues need to help students make connections during the difficult, teenage years. Board Meeting Archives, Budget/Financing, Elections, Governance/Board Decision Making, School Climate, Staff Support, What Can I Do? The Madison School Board heard presentations this past Monday from The District’s HR Director, Bob Nadler and Assistant Superintendent for Business Services Roger Price. Both described the functions that their organizations provide to the District. The District’s Budget increases annually ($329M this year for 24,490 students). The arguments begin over how that increase is spent. Ideally, the District’s curriculum strategy should drive the budget. Second, perhaps it would be useful to apply the same % increase to all budgets, leading to a balanced budget, within the revenue caps. Savings can be directed so that the Board can apply their strategy to the budget by elminating, reducing or growing programs. In all cases, the children should come first. It is possible to operate this way, as Loehrke notes below. Learn more about the budget, including extensive historical data. Is it Possible to Have a Good School District with Less Money? How to Reform Your Local School Board. Nutrition, Student Support, What Can I Do? Rafael Gomez and volunteers from this site organized a Schools and Nutrition Forum Wednesday evening, November 30, 2005.
Who would believe that I’d call any MMSD data excellent? But first, the critical point: I respectfully urge the board of education to approve funding in the next budget to expand Read 180 to West as part of West’s English 9 and English 10. Read 180 would help those students who cannot read well enough to succeed in those courses, as well as all other West courses. After I asked and asked for data on the costs of various programs, the MMSD finally posted (without any fanfare) useful figures on the cost of Read 180, a successful program used in Wisconsin and across the nation to teach reading to adolescents. The MMSD praised Read 180, but the superintendent said the district had no funds to expand the program. Now we see that the computer-based Read 180 curriculum costs about $40,000 per school for hardware and software, according to the MMSD figures. Read 180 could address the lack of any current proposal for instruction for poor readers in English 9 and 10. With real numbers about costs, the board of education can now decide whether it’s willing to find $40,000 in the next budget to round out West’s English curriculum. Once low-skilled readers can actually read at grade level, core English might begin to make sense. But not until all the students can read at grade level. Consider the National Assessment of Educational Progress, a federal study released last month. It found that, despite some improvement, American kids remain academically underwhelming. Only 31 percent of fourth-graders, for instance, were rated ”proficient” or better in reading. Just 30 percent of eighth-graders managed to hit that mark in math. In recent years, I’ve taught writing at an elite public high school and three universities. I’ve been appalled at how often I’ve encountered students who could not put a sentence together and had no conception of grammar and punctuation. They tell me I’m a tough grader, and the funny thing is, I think of myself as a soft touch. ”I’ve always gotten A’s before,” sniffed one girl to whom I thought I was being generous in awarding a C-plus. It occurs to me that this is the fruit of our dumbing down education in the name of ”self-esteem.” This is what we get for making the work easier instead of demanding the students work harder — and the parents be more involved. They should be running in the opposite direction. A reform effort launched by Charlotte-Mecklenburg in the late 1990s focused on shifting more district funds to low-performing schools from schools that were doing better — a move that has lately created some backlash. The district also reduced class sizes in those schools and offered to pay graduate-school tuition for teachers who agreed to work in those schools for at least two years. The district also required all of its elementary schools to adhere to a strict, phonics-based reading program. And it brought more learning-disabled students back into mainstream classrooms and paired up teachers who had been teaching them separately. Now, “you have a great combination of teachers who are very, very versed in reading and teachers who are very, very versed in additional learning strategies,” says Frances Haithcock, the district’s interim superintendent. Fifty years after Milton Friedman first proposed the idea of education vouchers, school choice proposals come in all shapes and sizes. We asked a dozen experts what reforms they think are most necessary and promising to improve American education. We also asked them to identify the biggest obstacles to positive change. Here are their answers. Comments should be sent to letters@reason.com. Via Joanne Jacobs who has more on Math Curriculum in China. Here is a synopsis of the English 10 situation at West HS. Currently — having failed to receive any reply from BOE Performance and Achievement Committee Chair Shwaw Vang to our request that he investigate this matter and provide an opportunity for public discussion — we are trying to get BOE President Carol Carstensen to put a discussion of the English 10 proposal (and the apparent lack of data supporting its implementation) on the agenda for a BOE meeting. Aside from the fact that there is serious doubt that the course, as proposed, will meet the educational needs of the high and low end students, it is clear we are witnessing yet another example of school officials making radical curricular changes without empirical evidence that they will work and without open, honest and respectful dialogue with the community. This week is the official start of the spring campaign season, and three local parents are launching bids for Madison’s board of education. Arlene Silveira, 47, the president of Cherokee middle school’s parent-teacher organization, and Maya Cole, 42, an active member of the parent-teacher group at Franklin-Randall, are seeking the open seat being vacated by Bill Keys. Both say they’ll circulate nomination papers starting Dec. 1, the first day the law allows. And, in the race generating the most buzz, Lucy Mathiak is seeking the seat now held by Juan Jose Lopez. The most aggressive of the three candidates, Mathiak could significantly alter the makeup of the board. Events, Governance/Board Decision Making, History - Madison Schools, School Climate, What Can I Do? While viewing the MMSD web site I came across some data called District data profile that suprised me, and answered some of my questions concerning low income disparity. While sitting on the task force, I have been bothered by the districts solution for dealing with high numbers of low income students by rearranging school boundaries and/or paring schools, and wondered if you really solved the disparity issue or if you shifted the issue to another school or something that would have to be solved at another time. 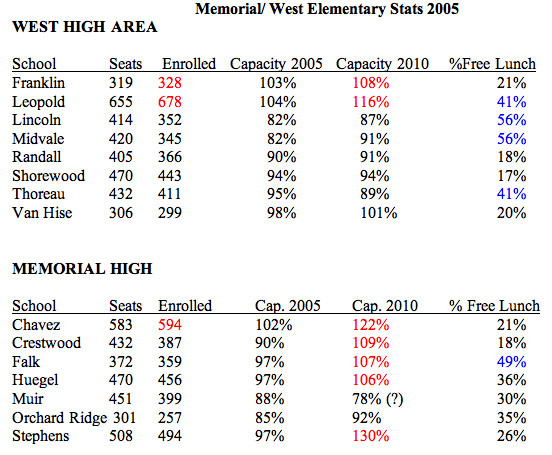 Madison school district low income percentages per www.mmsd.org 1991 – 2005. In 13 years, 1992 to 2005, MMSD low income percentage has gone from 24.6% to 42%. Has the definition of low income changed during this time period? Has the community as a whole really changed this much in 13 years? As a community member that hears and believes there is no low income housing, where do these people live if 42% of our community is now low income? We have lost 1000 elementary students in the same time period and doubled our minority students. Is this a wave of low births or are we losing students? In 1991 there were 4776 students with a 20.3% low income. In 2005 there are 5297 students with a 38.6% low income. In 1991 there were 6435 students with a 12% low income. 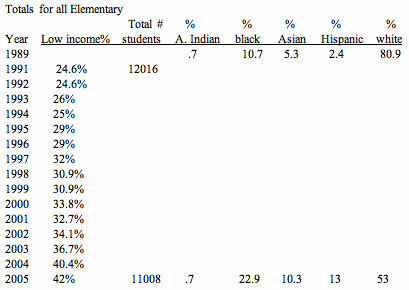 In 2005 there are 8429 students with a 28% low income. The question about pairing two schools and whether it improves low income percentage numbers over time was also in the data. Lincoln in 1991 was at 51% low income, 1997 59%, and 2005 69%. Midvale in 1991 was 42% low income, and 2005 it is at 64%. It does not seem to have improved the high percentage of low income numbers. Wright Middle School Charter Renewal – Leopold? SARAH JACOBS’ son Jed, 9, has a learning disability. He’s easily distracted and, if asked to do too many things at once, panics. At his former school, a private academy that cost $20,000 a year, his mother says Jed got into trouble daily (“kicking and even some biting”) and stopped learning. “He was reading ‘Captain Underpants’ in kindergarten and he was in third grade and still reading ‘Captain Underpants,'” she says. Juan Lopez, chair of the Board of Education Committee on Human Resources, released a report on the MMSD’s worker’s compensation experience after a critical story on Madison’s WKOW-TV. The new MMSD report seems only to repeat the information contained in the TV report. Great steps have been taken over the last few years to improve MMSD’s worker’s compensation reporting and claims (loss) experience. This has resulted in a significant drop in our experience mod and subsequently in our premiums. We have also realized adjustments in each of the last two years as a result of a positive loss experience. However, some of these improvements will be difficult to sustain with the limited staff assigned to Risk Management. Work is underway to create a Safety Committee that could fill part of the void left by the reduction in staff. The review was carried out by Jim Rose, a former director of inspections at England’s schools’ inspectorate, Ofsted. “The time is ripe in Maryland, and nationally, for parent involvement to be seen as the critical element that it is, not as an add-on,” Grasmick said in a recent letter to education reporters. Grasmick said the state also would begin to consider family involvement when it gives awards to principals, teachers and schools. And she said the department would redesign its Web site, http://www.marylandpublicschools.org , to make it more friendly to parents. How parents affect the educational equation is a subject of debate. Some experts say rigorous academic programs and a quality teaching force are more important. More on similar efforts in New York and Chicago. Soft Drink Sales Down in US Schools? the American Beverage Association sounds almost proud when it declares in a report being released Thursday that the amount of non-diet soft drinks sold in the nation’s schools dropped more than 24 percent between 2002 and 2004. The trade group’s report is an effort to deflate threats of a lawsuit against soft drink companies, which face mounting pressure as childhood obesity concerns have led schools to remove sodas. During the same two-year period, the amount of sports drinks sold grew nearly 70 percent, bottled water 23 percent, diet soda 22 percent and fruit juice 15 percent, according to the report, which is based on data from beverage bottling companies. Regular soda is still the leader within schools, accounting for 45 percent of beverages sold there this year. But that’s down from 57 percent three years earlier, the industry said, citing additional numbers based on 2002-2005 data.